As presented in Chapter 2, airbreathing propulsion advocates fought a losing battle to change the space launcher paradigm from expendable rockets, that are launched for the first, last, and only time, to sustained-use launchers that were more like military airlift transports with long and frequent usage [Anon., Lockheed, 1967]. Chapter 3 has details of the debate that took place in the US, following which even a sustained-use rocket launcher proposed to support the military Manned Orbiting Laboratory (MOL) was discarded, as was MOL, as not having relevance in a purposely designated "civilian" space fleet. As a result most, if not all, of the military high-performance hypersonic gliders design and performance data was forever lost, together with the benefits of these high-performance systems to the civilian space organization. The challenge of airbreathing propulsion, based on what were indeed rational assumptions when applied to rockets, resulted (and to many still results today) in large, ponderous and too costly vehicles. Even though that was challenged, as shown in Figures 2.16 and 2.17, lasting impressions were that airbreathers were too large and too expensive, and they required too long a development period when compared to rocket-launching systems. This is factually contrary to the actual rocket record, an example being total lack of manned launches during the 12-year period the Space Shuttle was being developed. Chapter 3 also shows that, when propulsion systems are put on a common basis, and the lifting body configurations are used, there are indeed differences in weight between rocket and airbreathing propulsion, but no significant size or industrial capability index differences. So, the fact remains, if we are to transition from the status quo today, as illustrated in Figure 2.22, into the commercial space scenario of Figure 2.23, something has to change to support the flight rate such a commercial infrastructure would require. However, it must be said that this particular status quo is comfortable, and profitable, for the telecommunications and launcher companies. In order to achieve a transportation system to space analogous to the transcontinental railroad, i.e., that can support a commercial space infrastructure, the shift must be to include an airbreathing launcher to meet the high flight rate requirements. The MOL was designed for 20 to 27 persons. The support spacecraft would carry 9 to 12 persons or materials to re-supply the station. For that goal the payload planned was a 7 metric ton payload (15,435 lb). An airbreathing launcher would be at least one-half the weight of the rocket vehicle in Figure 3.20, requiring one-half the resources. The MOL study identified that each replacement person would have a 994-lb (450-kg) resource supply payload to accompany each crewmember. 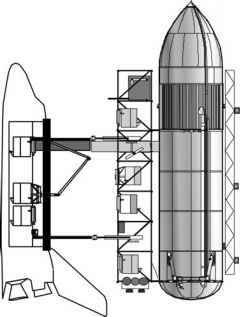 For a 12-person crew replacement mission, that makes the crew replacement payload 15,228 lb, well within the 7-ton payload capacity. The operating parameters for the station were a nominal 21-person crew. The same study determined that 47,000 lb (21,315 kg) of resources were required per crewmember per year. For one year, with a 21-person complement, that means 448 metric tons (987,000 lb) of supplies needs to be lifted to the station for crew support, not counting propellants to maintain the station orbit. With 21 crewmembers, there are four flights per year required to meet the 6-month assignment requirement. To lift the crew supplies to the station would require 64 flights per year, not counting propellant and hardware replacement missions that may require another five to six flights per year. The number of flights to a large station is then at least 74 flights per year. From a military mission analysis, that would require a fleet of 10 aircraft (14, counting in operational spares) that flew seven times a year for 15 years, and a 100-flight operational life [Czysz, 1999; Zagaynov and Plokhikh, 1991]. Using instead the present rocket launchers, that becomes a total of 1,050 launches by 1,050 rockets. To the MOL designers of 1964 it was instead a fleet of 10 to 14 sustained-use vehicles operated over a 15-year period, plus repair and maintenance. That vast difference in outlook between the aircraft manufacturers and the ballistic missile manufacturers remains today. Sustained-use remains as a poor competitor to expendable rocket rather than being a necessity for the future of commercial space. Just as ground transportation has railroad trains, over-the-road tractor-trailers, cargo trucks, busses, and automobiles, so space must have a variety of transportation vehicles with different payload capacities and fly rates. The United States is still lacking a heavy-lift capability as we once had with Saturn V. There is yet to be constructed a dedicated space exploration system. We need the capability of sending heavy payload to the gas giants such as Jupiter and Saturn; moderate payloads to the outer planets; and modest payloads to the boundaries of our Solar System [Anfimov, 1997], all in comparable travel times. Airbreathing propulsion will not help us in space, but it can enable lighter, sustained-use launchers that increase the frequency to orbit and reduce the cost to an economically practical value that will enable more space infrastructure and space exploration.